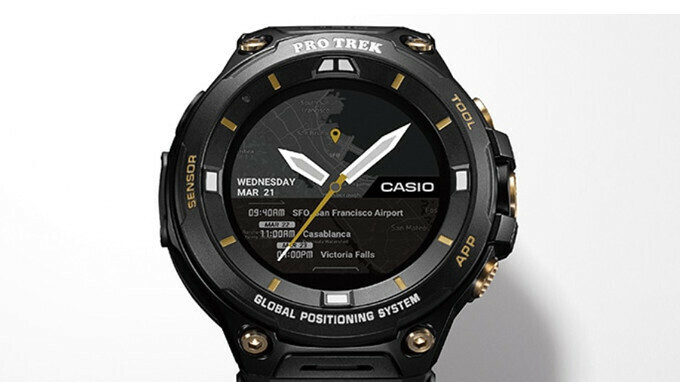 Casio has just announced its next smartwatch for true adventurers – the limited-edition WSD-F20SC. Perhaps the name won't tell you anything, so we're going to clear it up for you. The new Casio WSD-F20SC is a more expensive version of the regular WSD-F20 smartwatch that was officially introduced one year ago. Unlike the standard model, the limited-edition edition WSD-F20SC will not be available in large quantities. According to Casio, only 700 units will be available for purchase in late June when the smartwatch will be released. The wearable device hasn't been priced yet, but it will cost way more than the regular version that's on sale for around $500. The smartwatch sports a 1.32-inch dual layer touchscreen featuring sapphire crystal. It's got ion-plated buttons on the side, which are IP-treated for enhanced wear resistance, as well as a field composite band that combines metal-reinforced urethane H-links with fine-resin connecting pieces. Also, the case back is made of stainless-steel. The limited-edition smartwatch is fully compatible with Android and iOS devices, but it requires Android 4.3 or later, and iOS 9.0 or newer. Who still buys smartwatch? And 700 units is not limited, it's more than enough. People who want to use their phone less and thus be more productive and less addicted. Since Android Wear 2.0 or now Wear OS. You don't need a phone. You can install apps directly on the watch by using the watch itself to install things. The Play store is on board. Plus there is lots of useful apps now. Also the mil-810 standard means that this smart watch is shock proof, dust proof, frost proof, and desert proof as well. Oh, and if the battery runs out of this smart watch. The other display can still show the time for over a month. I plan to get a smartwatch. And not because I wanted to be like a rich person. I want something that can track my walking distance. My heart rate, track my location. And of course. It's rechargeable! Wear OS, the google+ of smartwatches, it used to be cool, now its just a dead platform for OEM's to cash out of couple of android users who actually buy them. Samsung's tizen and apple's watch os is the way to go. Your comment makes zero sense because Samsung and Apple cater with their respective operating systems only their own smartwatch ranges. What system should the competition use? Also there is nothing that an Apple Watch or a Samsung Gear can do that a Google Wear OS device cannot. The negative perception about Wear OS is unsubstantiated rumour mill driven by poor journalism and poor sales performance. But poor sales performance in this case has nothing to do with the competence of Wear OS. It has rather to do with the fact that generally smartwatches haven't found yet a must-have reason to exist. Only Apple has the brand image power to push products to people that they don't need. But in reality an Apple Watch is neither better looking, nor faster, nor more reliable, nor more technologically advanced than a well equipped Wear OS watch. It's actually lacking in many areas, like battery life, lack of always on display, downloadable watchfaces, lack of keyboard, inferior Siri to Google Assistant and more. Too old school here I guess. I carry my phone on a belt clip, so it's always with me. I am still a heavy phone user, so to stay safe I use a BT headset (my first BT headset was a two piece called a plantronics M1500...back in the Motorola Star-Tac days). I do a lot of work with my hands, so being "hands free is a big plus. I can't see the "need" to spend over 100 dollars, for a smart watch, with battery life measured in a day or two, when my dumb casio watch, has a battery measured in YEARS. It tells the time, day/date, in 3 time zones, easy to read and darn near indestructible. I guess if the price comes down to under $100.00, the battery can last a week, I might consider one, but for my personal tastes? Nope...just a trendy toy. I find it funny how most people find battery life and pricing the two main reasons to stay away from smartwatches, when in reality these are the two most irrelevant factors: I have had smartwatches since 2012 and I must say that charging them daily was never an issue. Also it never occurred to me that my smartwatch would die on my wist before I'd return it to the charger, unlike many of my phones. Actually one of my smartwatches (the Sony Smartwatch 2) had a four day battery life, but I was still charging it daily, just because it was such a simple thing to do. People make it sound as if charging a smartwatch is a terrible daily chore, like cleaning a toilet. It's just taking it off from your wrist for a couple of hours and placing it on a magnetic plate (not even having to plug it). The only scenario when charging a smartwatch is problematic is when you are a regular traveller, because it means you need to carry an extra charger and hope that the hotel room has a lot of wall outlets. Pricing is also irrelevant, because people can pay anywhere from $10 to $1000000 for something to wear on their wrists. I actually read people's comments and I realised that people get a lot more satisfaction from expensive smartwatches like TAG Heuer Connected or Apple Watch rather than from cheap Asus because they buy them primarily for what they are; expensive, beautifully crafted toys (at least in the case of TAG Heuer) , rather than for their usability factor which, lets face it, it's not a major factor, regardless which smartwach.